Dubai’s Roads and Transport Authority (RTA) has opened Phase One of the Dh800-million ($217 million) Latifa bint Hamdan Street and Umm Al Sheef Street Improvement Project and is on track for completing the next phase in the first quarter of 2019. On completion, the project will link Jumeirah with Al Khail Road and Parallel Roads (First Al Khail Road, and Al Asayel Street) through a network of bridges, said a statement from RTA. The project features two-level bridges extending 7.4 km long, including one that crosses over Dubai Metro Red Line. Once completed, the bridges will help reduce the transit time on Latifa bint Hamdan Street between Sheikh Zayed Road and Al Khail Road from 12 minutes to four minutes. It will also ease the movement of trucks from and to Al Qouz Industrial Area. The project will serve eight urban development projects by 2020, and 10 others by 2030. It will also serve four residential districts by 2020 and four others by 2030, said the statement from RTA. About 680,000 people will benefit from the project by 2020, and the number of beneficiaries will rise to 1.2 million by 2030. It will serve five industrial areas by 2020 and five others by 2030. According to RTA, nearly 370,000 workers will benefit from the project by 2020, a number that will rise to 724,000 by 2030. Mattar Al Tayer, the director-general and chairman of the board of executive directors of RTA, said the aim of the project was to enhance the roads network extending east-west and link them with the main roads such as Sheikh Zayed Road, Sheikh Mohammed bin Zayed Road and Emirates Road. "It also supports the urban and economic upswing in the surrounding areas, besides reducing the traffic density on Al Wasl Street by 10 per cent in the sector between Al Manara and Al Hadeeqa Streets. It also serves the new urban developments such as Dubai Hills, Meydan, Al Khail Gate and Dubailand. It serves residential communities such as Umm Suqeim, Jumeirah, Al Wasl, and Al Qouz Residential Area," stated Al Tayer. Phase One includes the improvement of Latifa bint Hamdan and Umm Al Sheef Streets from Al Safa Junction (Second Interchange) to Al Manara Junction on the Sheikh Zayed Road (Third Interchange). 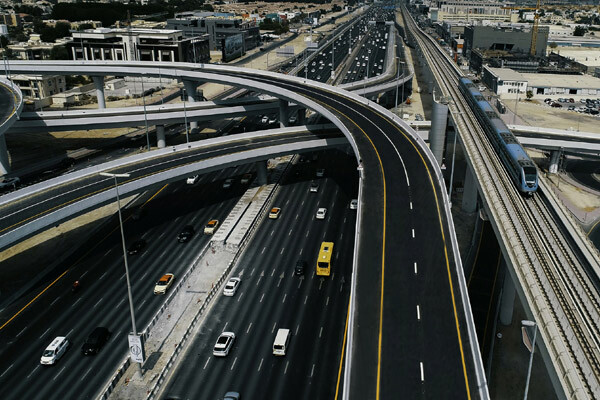 It also involves linking Jumeirah with Al Khail Road and the Parallel Rods (First Al Khail Road and Al Asayel Road) through constructing two-level roads and bridges providing free traffic movement from Umm Al Sheef street in the direction of Al Wasl Street and Sheikh Zayed Road up to Latifa bint Hamdan Street. It also includes extending Al Zomorrod Street eastward to the Sheikh Zayed Road, and the two bridges link at the Sheikh Zayed Road through bridges providing free exits. The bridges passing over and under the Route of the Dubai Metro Red Line were accomplished without affecting the operation of the metro, said the RTA satement. Works included the construction of a junction at the Latifa bint Hamdan Street with the First Al Khail Road and a signalised junction underneath the bridge. Works also include the construction and improvement of Umm Al Sheef-Al Wasl Streets junction, main surface roads, service roads and landscaping works along the Sheikh Zayed Road between Al Safa and Al Manara Interchanges as well as the junction of Al Manara and Umm Al Sheef Streets, and Latifa and Al Zomorrod Streets. In Phase Two, RTA said the scope of work includes improvement of the link between Sheikh Zayed Road and Al Khail Road, and between Jumeirah to the west and Dubailand to the east. It also aims to improve the entry points of Al Qouz areas and other development projects besides revamping the existing road extending three km from First Al Khail Road to the junction of Al Khail Road. Works are currently underway in improving the junctions along the sector. The junction of Latifa bint Hamdan and Al Asayel Streets is upgraded from a surface signalised junction to a flyover comprising a first deck bridge of three lanes in each direction to serve the traffic movement on Latifa bint Hamdan Street, it stated. RTA said the second phase work also includes the construction of second deck bridge of two lanes in each direction to serve the traffic movement on Al Asayel Street and to upgrade the surface intersection to reduce the waiting time at the existing intersection from three to less than a minute. It will reduce the traffic congestion by 78 per cent during the evening peak hours, and increase the capacity of the junction by 40 per cent.